Scouts (10 and a half-years – 14-years). Based at the Scout Hut, Giant Axe Field, West Road, Lancaster. We are also affiliated to Castleton Explorers (14-18 year olds), who meet at our hut. Please click the links above for more details about the particular sections, and the link below to download our Welcome Pack which will give you general information about joining the group. Our hall is available for bookings at other times. It has a fully equipped kitchen, toilets including an accessible toilet, direct access to the playing fields behind the hut and a pay & display car park. If you are interested in using the hut, please email the Group Secretary (13th DOT lancaster AT gmail DOT com) for more information. We are running a plant stall at the Scout Hut (West Road, Lancaster, AL1 5PE – come and find us) on Saturday 20th May from 9:30am until 12:00 noon. Come and see us, buy some lovely flowers for your garden, fill the planters on your decking or in your yard, or brighten up your flower box … Continue reading Plant Sale! Could you be the next 13th Lancaster Group Treasurer? 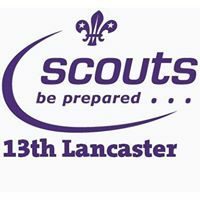 13th Lancaster Group is looking to appoint a new Treasurer. If you have family or friends already involved with 13th Lancaster then you’ll already know what a welcoming and fun loving group we are. Would you like to become more involved and make a contribution to this amazing Group? The new Treasurer is needed from April … Continue reading Could you be the next 13th Lancaster Group Treasurer? In case you didn’t see the Facebook post last Monday night, we raised a grand total of £526.77 at the Christmas Fair last week. Thank you very much to everyone who came, and to everyone who helped out.